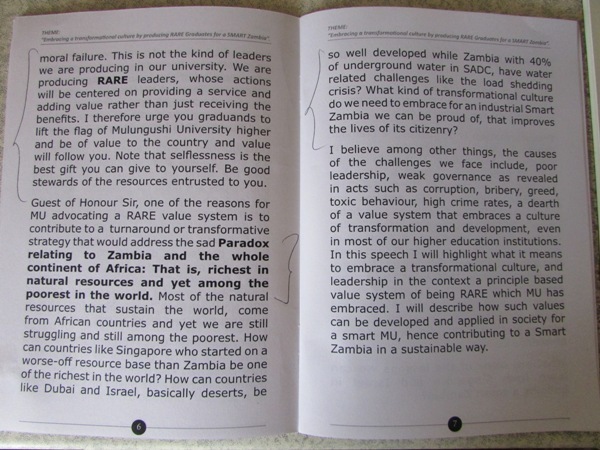 Here is an extract from Mulunhgushi university Vice Chancellor professor Hellicy Ngambi’a speech during the 7th graduation ceremony held on Saturday 30th October 2015 and graced by higher education minister Dr. Michael Kaingu, drawn from pages 6 and 7 of the speech booklet. Guest of honour Sir, one of the reasons for MU advocating a RARE value system is to contribute to a turnaround or transformative strategy that would address the Paradox relating to Zambia and the whole continent of Africa: That is, richest in natural resources and yet among the proorest in the world. Most of the natural rsources that sustain the world, come from African countries and yet we are still struggling to and still among the poorest. How can countries like Singapore who started on a worse-off resource base than Zambia be one of the richest in the world? How can countries ;like dybai and Israel, basically deserts, be so well developed while Zambia with 40% of underground water in SADC, have water related challenges like the load shedding crisis? What kind of transformational culture do we need to embrace for an industrial Smart Zambia we can be proud of, that improves the lives of citizenry? I believe among other things, the causes of the challenges we face include, poor leadership, weak governance as revealed in act such as corruption, bribery, greed. Toxic behaviour, high crime rates, dearth of a value system that embraces a culture of transformation and development, even in most of our higher education institutions. In this speech I will highlight what it means to embrace a transformational culture, and leadership in the context a principle based value system of being RARE which MU has embraced. I will describe how such values can be developed and applied in society for a smart MU, hence contributing to a Smart Zambia in a sustainable way.